The Swiss Arrivals Lounge in Zurich Airport is fairly new, although I never experienced the old, apparently cramped arrivals lounge, so I had nothing to compare it to. 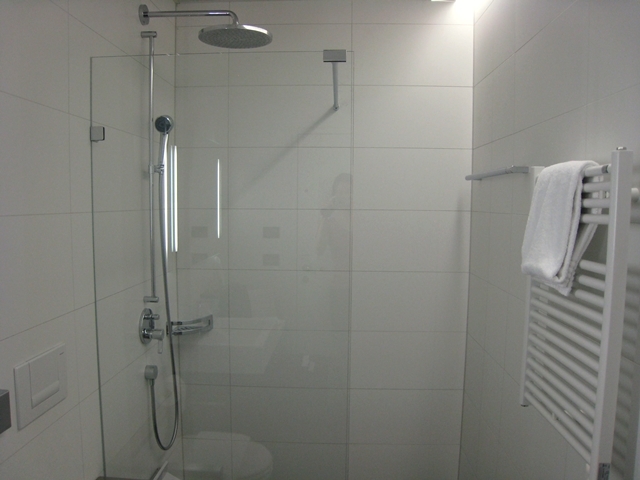 Since I hadn't slept well on my flight from Bangkok (see Swiss Airlines Business Class Review) I was looking forward to a shower to refresh and help wake me up before getting some work done. I initially took some wrong turns, but was helpfully advised to simply exit baggage claim, and it would be on my left, which it was. I was buzzed in, then took the elevator up to the lounge on the second floor. The toiletries were something called Pure Herbs, which was ironic, as they were full of the kinds of chemicals I try to avoid: sodium laureth sulfate, parabens, etc. 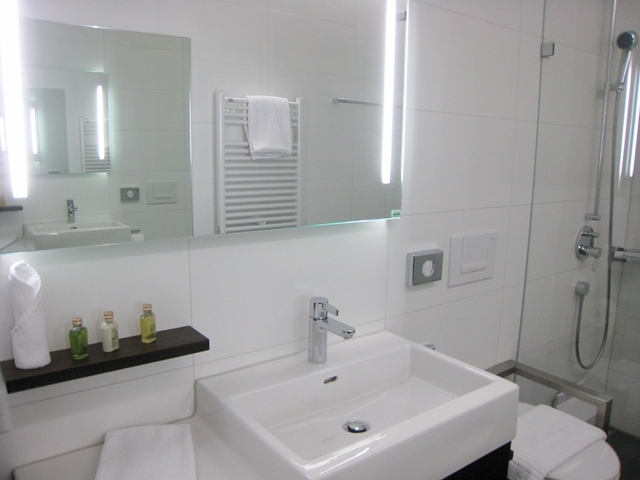 I was glad to have brought my own toiletries. 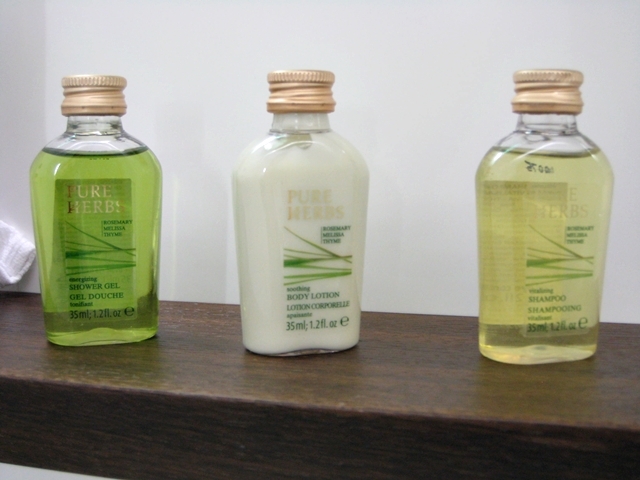 Never having been to Switzerland, I still had this stereotypical image of Switzerland being all about pristine nature and natural, eco-friendly products, but “Pure Herbs” toiletries directly undermined that, as did all the people smoking that I subsequently saw in Zurich–far more than I ever see in New York. Everything was fine until I actually started taking a shower, which was when I discovered that although the drain worked perfectly fine, the water simply ran out of the open shower and all over the floor. I just barely managed to rescue my suitcase and shoes, before the water reached them, but the water continued to seep out under the door of the shower room. A huge mess, and definitely not a tribute to Swiss engineering. How hard is it to make a shower floor that tilts the right direction and drains properly? 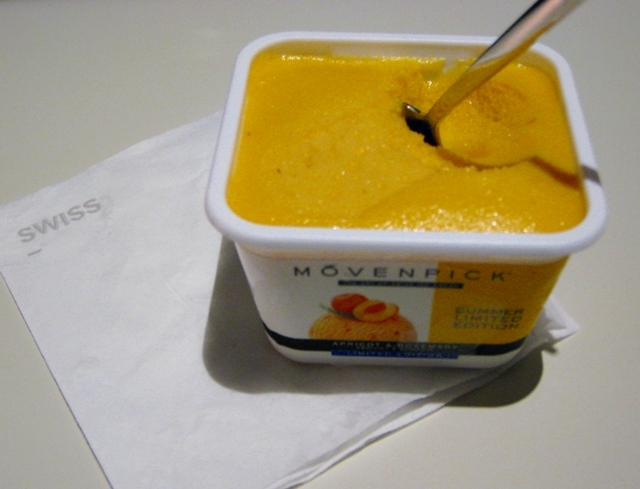 None of this appealed, so instead I chose some Movenpick apricot sorbet from the ice cream freezer. 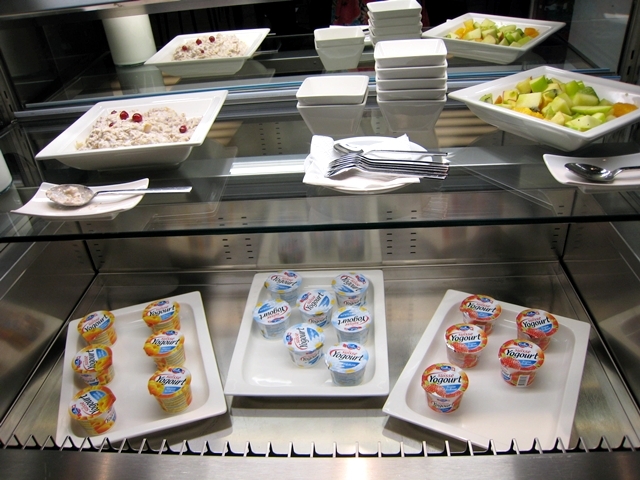 While not as good as premium ice cream or gelato, this was definitely the best edible thing in the lounge, in my view. 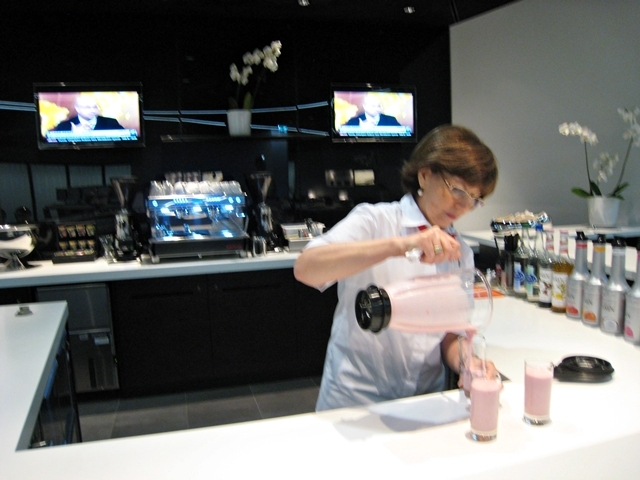 I worked for a while, going through a couple of the WiFi cards, and before I left to go to Parkhuus at the Park Hyatt Zurich, I noticed that the bar area offered power smoothies. I inquired, and the only ones made with fruit (not just syrup) were the banana smoothie and the raspberry smoothie, so I chose raspberry. The attendant here was reserved, but friendlier than the one at reception. The smoothie itself was ok, but somewhat tasteless, and not nearly as good as the simple ones I make at home with juice, frozen fruit, banana and plain yogurt. One thing I didn't get a chance to try, since I had to get work done, but certainly would have asked about otherwise, are the 3 bedrooms. Such a good idea for an arrivals lounge, and probably the thing that I'd most want to use if I ever come back to this lounge. 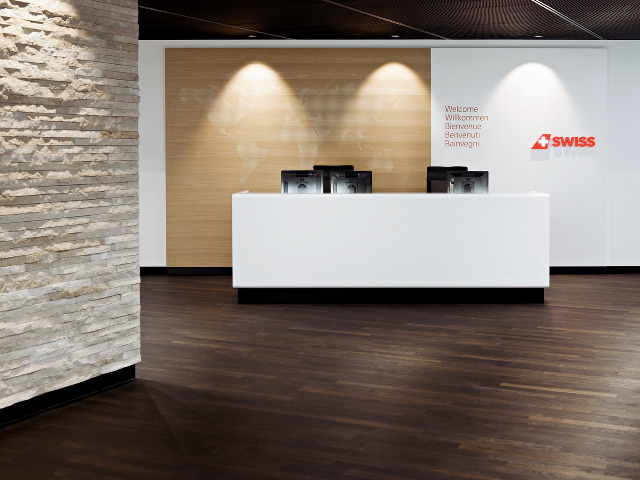 The Swiss Arrivals Lounge is open daily 6am-1pm (so you're out of luck if you you arrive on a later flight). In terms of using the lounge, here's who has access, taken directly from the Swiss Web site. 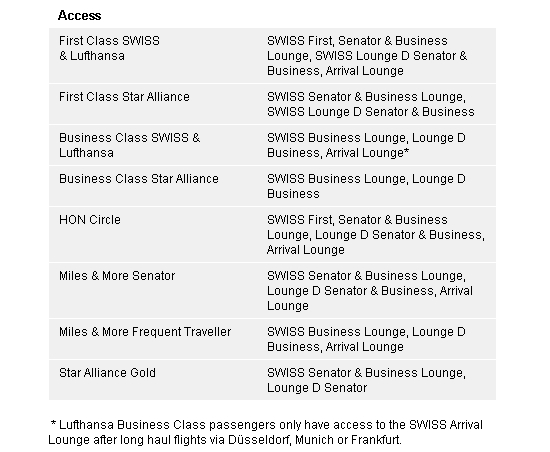 Note that Business Class and First Class Star Alliance and Star Alliance Gold passengers do *not* have access; you would need to actually be flying SWISS or Lufthansa Business Class or First Class (and for Lufthansa, be arriving after a long haul flight via Munich, Frankfurt or Dusseldorf). 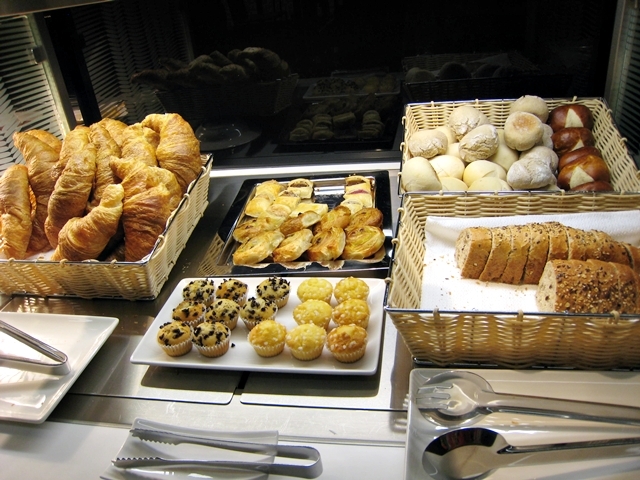 The verdict: I definitely need to start lowering my expectations for airline lounges. 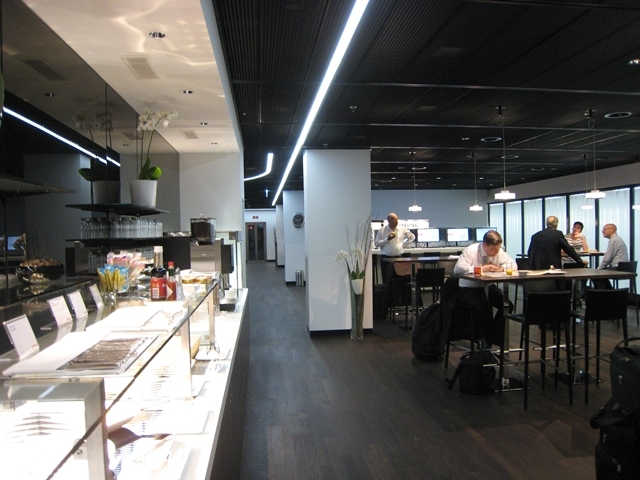 Don't get me wrong, the Swiss Arrivals Lounge at Zurich Airport is great to have access to, especially as there are many places that don't even have an arrivals lounge, depending on which airline you're flying. But after the excellent service en route, the grumpy attendant at reception, flooded shower and tasteless smoothie were not impressive. I was grateful that the WiFi worked well and that there was apricot sorbet. And perhaps if I'd gotten a good night's sleep (or caught up on sleep in one of the 3 bedrooms in the Arrivals Lounge) I wouldn't be so critical. Then again, I'm writing this weeks later in a pretty well-rested state, so I'll argue it's pretty balanced but that I just need to have lower expectations. 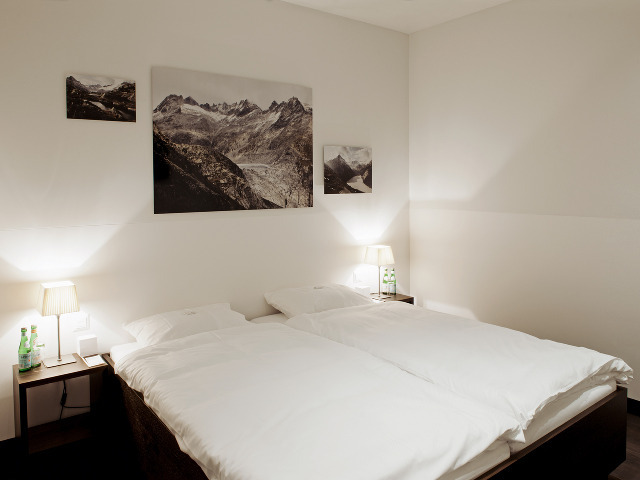 Does Swiss First Class Award Availability Exist?